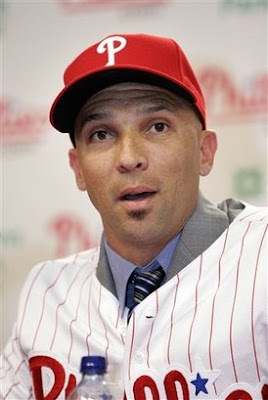 Back to last night: Honestly, has any Phillie ever captured the fanbase this strongly and so quickly than Raul Ibanez? Floating. It took Pat Burrell years to feel that. It took Ibanez 18 games. Of course, when you hit a game-winning home run, provide consistent all-fields offense, make awesome plays in left field and knock a go-ahead grand slam all in your first 18 games, you too could be floating. Many of us questioned the pickup of Raul Ibanez – he’s a lefty, he’s old, he’s an American League hitter, his home run totals will evaporate. So far (and yes, it’s very early), we doubters have pie in our faces. Ibanez has been the team’s MVP so far. And already, he’s Philadelphia’s new favorite athlete.